It’s a tradition going back to 1973 here in Southern California; the sun flickers and drowns over the horizon, nightfall creeps across the land, and fog billows from Ghost Town and other areas of the theme park as it writhes in pain, transforming from Knott’s Berry Farm into the world-famous Knott’s Scary Farm! Okay – perhaps it’s not so dramatic; and to be honest, fans get just as excited reading that makeup and wardrobe operations have commenced in the early afternoon hours backstage in the fabled Warehouse P at Knott’s, and techs are making last-minute checks on fog machine juice and lighting inside the mazes and scare zones as media assembles for the opening night of Knott’s Scary Farm in Buena Park! 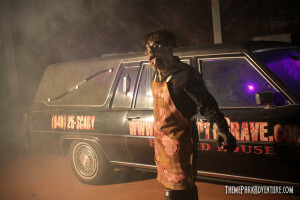 That’s exactly what transpired on the evening of September 24th; for Theme Park Adventure, it continued our 21st year covering the granddaddy of all Halloween events (the first event being the 2015 Scary Farm preview in August). 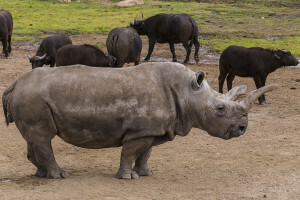 Nola, a critically endangered 41-year-old northern white rhinoceros who has been under medical care since early September for a recurring abscess on her right hip, underwent a second medical procedure earlier this month at the San Diego Zoo Safari Park. The elderly animal has been on antibiotics and keepers have been flushing the abscess site daily, but it is still an area of concern. In an effort to get to the source of the infection, veterinarians lanced deep into the abscess, but they weren’t immediately able to provide a definitive answer as to what is causing the ailment. During the procedure, the team opened the abscess site, allowing it to drain better and also alleviating any pressure buildup that can cause pain for the animal. A fine needle aspiration, skin samples and blood tests also were taken. 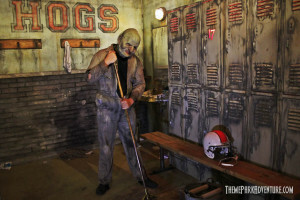 This weekend marks the opening of Orange County’s newest – and most anticipated – haunted attraction, The 17th Door. Located in the Tustin Marketplace, just about 10 minutes south of Disneyland off the 5 Freeway in Tustin, this new haunt has been the topic of much discussion – and speculation – among fans for the past several months. 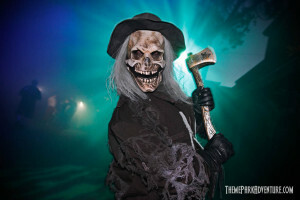 The amount of enthusiasm and curiosity within and outside of the Southern California haunt community has been unprecedented in the past months, as word spread of a husband and wife team who aren’t established haunters, creating a stunning, high-quality attraction in Orange County, unlike any other. 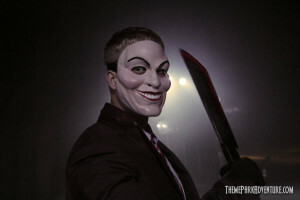 When we first learned about Robbie and Heather Luther, we were equally intrigued as everyone else; the couple went to TransWorld Halloween & Attractions Show in St. Louis earlier in the year and walked the floor, visited local haunted houses, and discussed the business with professional haunters. Back here on the West Coast, rumors were flying that this mystery couple was preparing to launch themselves head-first into the SoCal haunt community and make a resounding impact with their first endeavor, The 17th Door. It’s always a weird thing when the opening of Universal Studios Hollywood’s Halloween Horror Nights comes and goes. There’s so much hype leading up to the event – from Creative Director/Executive Producer John Murdy’s cryptic messages and hints on social media, to the major announcement he and Art Director Chris Williams make each summer at ScareLA in Los Angeles, and the sneak preview of some of the mazes that Theme Park Adventure has been privileged to attend for the past several years. It’s strange, because before we know it, we’re there, walking through the mazes, shooting video in the scare zones, taking it all in, and then – just like that, we find ourselves driving home at 3 a.m. discussing what we liked and didn’t like about the event – and how crazy it is that HHN has already come and gone for us. 2014 was a great year for our friends at The Empty Grave, one of Orange County’s longest-running haunted attractions. For the past couple of years, The Empty Grave was located at the Anaheim GardenWalk, just across the street from the Disneyland Resort. One might think that such close proximity to hundreds of hotel rooms and an endless supply of tourists would make for an incredible source of business for a haunt at Halloween. Unfortunately, the GardenWalk just isn’t that great of a magnet – rarely does it attract locals, and when the Disney parks are open late – guests are in them, not wandering around a half-dead shopping mall. Mike Talarico, who owns The Empty Grave, gave it one hell of a shot – and while there were decent crowds during the seasonal run, they just weren’t steady. Quite honestly, we felt that if Mike and his team stayed there at the GardenWalk, that The Empty Grave might just end up dying on the vine. We certainly didn’t want that to happen, because this is a great group of haunters.